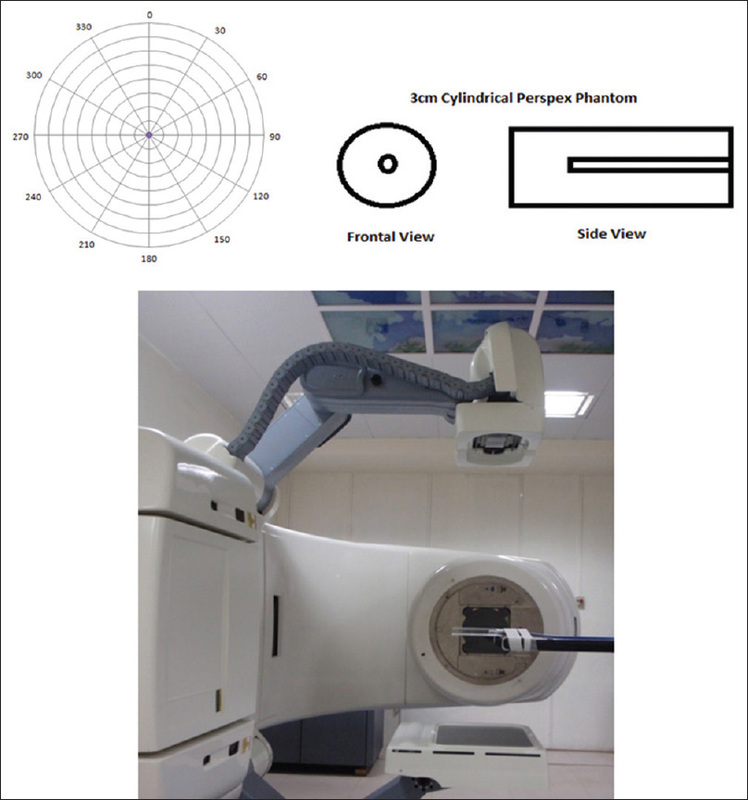 Image guided radiotherapy using kilovoltage (kV) cone beam computed tomography (CBCT) has emerged as the accepted method for patient positioning and verification for intensity modulated radiotherapy and stereotactic body radiotherapy of several treatment sites. The use of CBCT based image guidance has improved the accuracy in patient positioning; however the radiation dose delivered during imaging, though small could be significant due to repeated imaging with the CBCT., Measurement of small doses from the kV source during imaging requires a dosimeter that has ideal characteristics for measurements such as low energy dependence, high sensitivity, reproducibility, and should also meet the requirements of an imageable dosimeter. The dosimetric characteristics of micro MOSFET for the use in radiotherapy were investigated by Ramaseshan et al. It has been reported that micro MOSFET has a linear dose response from 5 to 500 cGy with no significant effect in the dose rate from 100 to 600 MU/min and uniform energy response for 4–18 MV. The angular dependence of micro MOSFET in phantom has also been investigated by Ramaseshan et al. using a cylindrical solid water phantom of 20 cm diameter and found to be within ±2%. The other MOSFET that is available for in vivo dosimetry is the OneDose MOSFET, which is a precalibrated dosimeter designed for one-time use and marketed by Sicel Technologies. The characteristics of this MOSFET such as the dose linearity and dependence on dose rate have been studied and reported by Halvorsen  for 2–400 cGy and dose rate from 80 to 480 cGy/min. Ding et al. investigated the feasibility of using a precalibrated single use OneDose MOSFET dosimeter designed for in vivo patient dosimetry for measuring the radiation dose from kV X-rays resulting from image-guided procedures. In this study, energy response and characteristics studies were carried using an ionization chamber and MOSFET dosimeters. 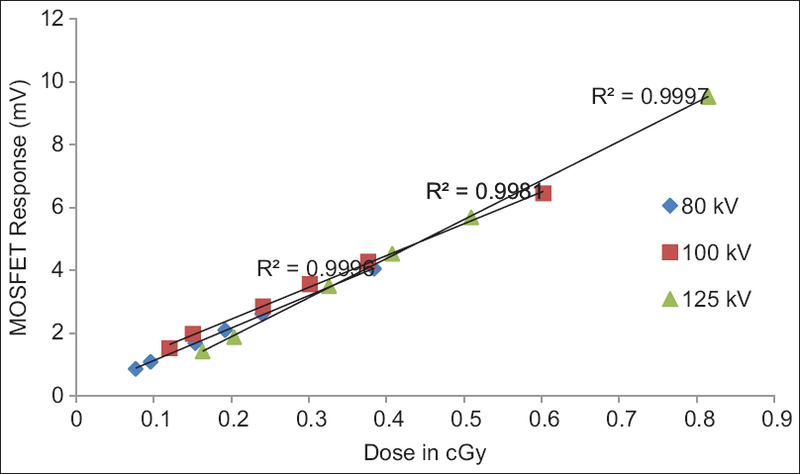 The reproducibility for the MOSFET dosimeters has been reported to be within 3% and the MOSFET dosimeters showed a linear sensitivity for the doses from 1 to 20 cGy for different CBCT scans. 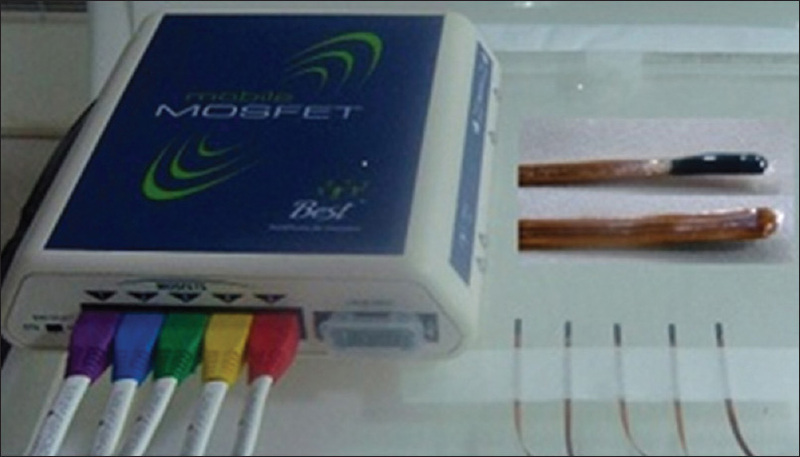 The dose during CBCT has been measured using MOSFET by Islam et al. who also studied the dosimetric properties for clinical CBCT. The dose measurements were performed using MOSFET detectors and ion chamber at the center, periphery and surface of 16 and 30 cm diameter cylindrical shaped water phantoms for kV beams for different field of view (FOV). In this study we have investigated the dosimetric characteristics with respect to energy dependence, angular dependence, and linearity of dose response of the MOSFET (TN1002RD) dose verification system (Best Medical, Canada) for the kV X-ray energies used for image guidance in radiotherapy. This study is performed as a preinvestigation for the use of this MOSFET dosimeter for routine in vivo dosimetry during image guidance in our clinic. The MOSFET dosimeter is an electronic device that measures integrated radiation dose. It is a silicon chip of 1 mm 2 with an active area of 0.2 mm × 0.2 mm, located under a black epoxy bulb. This study was carried out using TN1002RD mobile MOSFETs (Best Medical, Canada) of high sensitivity along with the reader module TN RD 70W dose verification system [Figure 1]. The reader module has a dual bias setting (standard bias and high bias) with a sensitivity of 10 mV/cGy for standard bias and 30 mV/cGy for high bias. The variation due to the change in the voltage caused by irradiation is proportional to the absorbed radiation. The wireless transceiver acts as a channel between the reader module and the remote verification software. The characteristics of the MOSFET dosimeters were studied for an on-board imaging system fitted with Clinac 2100 C/D medical electron linear accelerator (Varian Medical Systems, USA) used for 3D image guided radiotherapy. On-board imaging system is provided with 80, 90, 100, 110, 125 kV X-ray energies. Special filters like half bow tie (HBT) and full bow tie (FBT) filters are provided for improved imaging during CBCT mode., This study was carried out by keeping MOSFET dosimeters on perspex slab phantoms of density 1.18 g/cm 3 and 10 slabs of thickness 10 mm each were used to provide adequate backscatter. The beam qualities for the kV beams were characterized based on the half-value layers (HVL). The quality of X-ray beam depends on many factors such as the tube potential, target angle, target material, window material, thickness of the filtration material, shape of collimation, and the focal spot to chamber distance. However, the attenuator used for HVL measurement should be of high purity with 99% of the material of attenuator and for better accuracy of such measurements 0.5 mm thickness of attenuator were preferred. The attenuation measurements were carried out with aluminum (Al) attenuator with narrow beam geometry. The HVL were measured with a 4 cm × 4 cm field size and by keeping the attenuators at a distance of 50 cm from the source and the ionization chambers were kept at focal spot to surface distance of 100 cm without buildup cap , to ensure that the scattered radiation does not influence the measurement significantly. Where, Dw is the dose to water in the phantom, M is the leakage-corrected meter reading in Coulombs (C), NK is the air-kerma calibration factor of the ionization for the given beam quality Q in Gy/C, Bw is the backscatter factor, Pstem, air is the chamber stem correction factor accounting for the change in photon scatter, and is the water-to-air ratio of the mean mass energy absorption coefficients. The kV X-ray beam outputs were measured using markus PP ionization chamber (PTW Freiburg, Germany). The air kerma calibration factors for the PP chamber for the kV X-ray energies were obtained from the national standard laboratory at Bhabha Atomic Research Centre, Mumbai, India. The output measurements were carried out under reference conditions and the necessary correction factors such as backscatter factor and mass energy absorption coefficient were derived from AAPM TG 61 protocol.,, The MOSFET dosimeters were also irradiated under the similar experimental conditions which were used for measuring the outputs of the kV X-ray beams by the PP ionization chamber. Specifically, the MOSFETs dosimeters were placed on the surface of perspex slabs of thickness 10 cm and the measurements were performed for the kV X-ray beams available for imaging. The calibration factor (cGy/mV) of the MOSFET dosimeter was obtained by taking the ratio of the dose measured for a particular mAs and the MOSFET response in mV for the same mAs. Most of the dosimeters exhibit energy dependence particularly for low energy X-ray beams due to their higher atomic number. It is difficult to find a dosimeter that is tissue equivalent and energy independent over the entire energy range used in radiotherapy., Hence, a study of energy dependence is necessary for a dosimeter. In this study, we investigated the energy dependence of the MOSFET dosimeters for kV X-rays. The energy dependence was studied by measuring the response of the MOSFET per cGy of dose for the kV beams available in the linear accelerator. The MOSFET response per cGy of the dose was obtained by irradiating them to the kV beams for constant mAs (20 mAs) with a FOV of 10 cm 2 at 100 cm SSD. The MOSFEETs were placed on the surface of the 10 cm thick Perspex phantom that provided the necessary backscatter. The dose for 20 mAs for each of the kV beams (80, 90, 100, 110, 120 kV) was obtained by irradiating the calibrated Markus PP chamber with the same geometry. The shape of the MOSFET dosimeters does not represent a symmetrical geometry due to the inherent buildup. The response of the dosimeters could vary with direction and angle of incidence of the radiation beam depending on their construction, physical size, shape, and the energy of the incident radiation. In this study, we have investigated the response of the MOSFET dosimeters for angular dependence in their response.,, The angular dependence was studied for two different setups, one with MOSFETs kept in the air and the other in a cylindrical phantom at a depth of 3 cm. For measurements in air, the MOSFET dosimeters were placed parallel to the axis of the gantry rotation, at the isocenter of the linear accelerator, on Perspex slabs, but with MOSFET projected in the air. To study the angular dependence of the MOSFET in phantom, the MOSFETs were placed at the center of the 3 cm cylindrical phantom [Figure 2] and placed at the isocenter of the linear accelerator. The response of the MOSFET dosimeters were obtained by irradiating them at various gantry angles from 0° to 360° at every 30° of gantry position with an FOV of 10 cm 2 for the X-ray energies most commonly used for CBCT imaging (100, 110, and 125 kV) for both in air and in phantom. The linearity of dose response is an important characteristic of a dosimeter and this was analyzed for MOSFETs for all the kV X-ray beams of our CBCT system. This was performed by irradiating the MOSFETs for various exposure times (ms) and maintaining a constant tube current (mA) for each kV available with the on-board imager of the linear accelerator. In this study, the MOSFETs were kept on the surface of the Perspex phantom of 10 cm thickness to ensure adequate backscatter and to simulate the dose measurement condition on the patient. The outputs of the kV X-ray beams in cGy/mAs were determined based on the AAPM TG 61 using the Markus PP chamber. As a prerequisite for determining the output of the kV beams, the beam quality was determined by measuring the half-value thickness for all the kV beams using the Al attenuators. The HVL measured in mm of Al are given in [Table 1] along with the measured output values. It is observed from the data in this table that the beam hardening is quite evident with the HBT and FBT filters. The correction factors such as backscatter factor and mass energy absorption coefficient were obtained from the AAPM TG 61 protocol. The output measured in cGy/mAs increased with the beam quality. 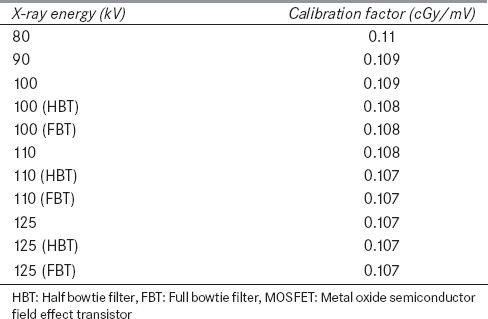 The calibration of the MOSFETs for surface dose measurement was performed and the calibration factors for all the X-ray energies are given in [Table 2]. The calibration factors are nearly constant for the all the kV beam qualities studied and the mean calibration factor was found to be 0.11 cGy/mV with a standard deviation of ±0.001. The mean calibration factor for the kV beam qualities at a depth of 3 cm was found to be lower by a percent and is 0.101 cGy/mV. The variation in response of MOSFET dosimeter with energy of the kV beam was studied by measuring their response at different kV X-ray beam qualities at constant dose values. 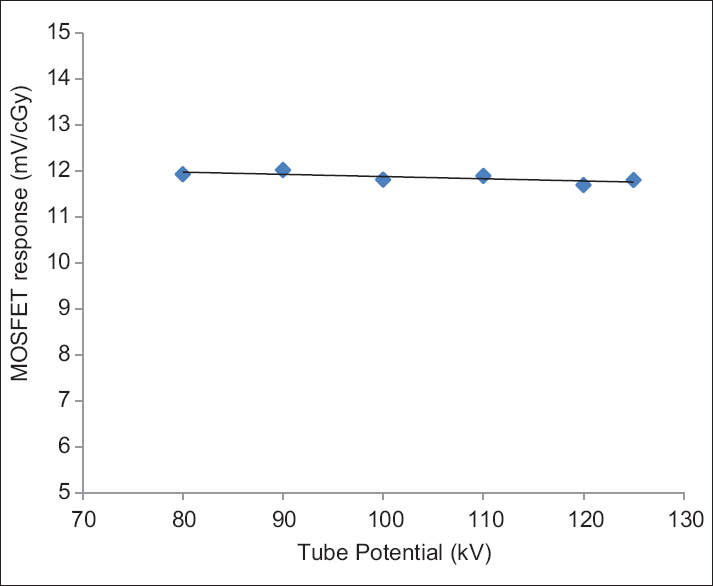 The mean MOSFET response per cGy of dose for all the kV beam qualities was found to be 11.85 mV/cGy with a standard deviation of ±0.11 mV. The measured MOSFET responses for various kV beam qualities are shown in [Figure 3]. The close observation of this figure shows that the MOSFET response is nearly independent of variation in kV beam quality of the image guidance system of our accelerator. 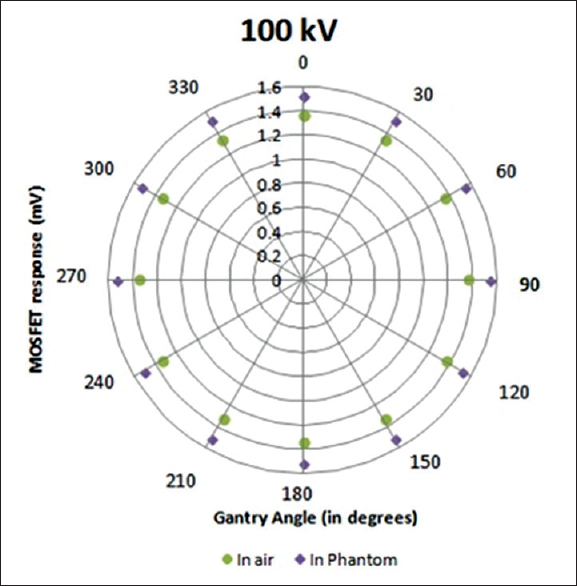 The variations in MOSFET response with the angle of incidence of the kV X-ray beams have been plotted for 100, 110, and 125 kV and are shown in [Figure 4],[Figure 5],[Figure 6] respectively for measurements performed in-air and in-phantom. 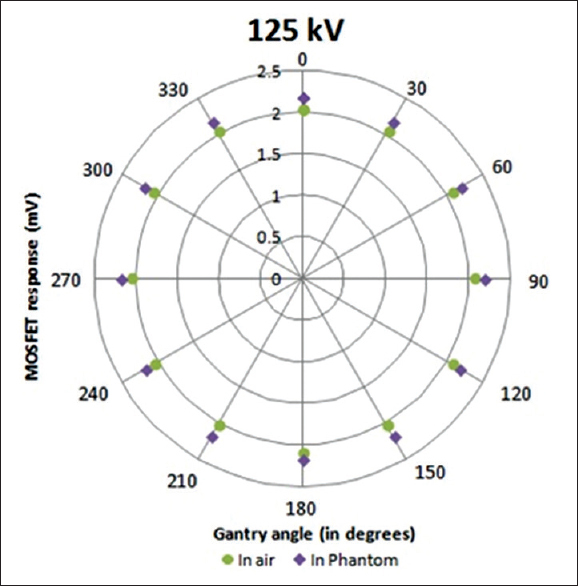 It is observed from the data in these figures that the maximum deviation in the response of the MOSFET with the angle of incidence of the radiation is within ±2% for the full rotation of the gantry from 0° to 360° for the X-ray beams of qualities 100, 110, and 125 kV for both in-air and in-phantom measurement conditions. This small deviation in the response of the MOSFET with the angle of incidence of the beam could be due to the additional path length traversed by the beam in the inherent buildup of the MOSFET dosimeters at certain angles. For all practical measurements, the response of the MOSFET is nearly independent of the angle of incidence for both in-air and in-phantom measurement conditions. For in vivo measurements, it is necessary that the detector is independent of the angle of incidence of the beam and the small size of these MOSFET detectors could be the reason for minimal dependence on the angle of incidence of the beam. As this study is performed as a prelude to the study on in vivo measurements during image guided radiotherapy with CBCT, it was important that this characteristic of angular dependence is studied. The linearity of dose response of the MOSFET dosimeters for the kV X-ray beam qualities were analyzed with an increase in exposure time (ms) for different mA settings. As dose versus MOSFET response had to be plotted, the dose delivered for the mAs setting was estimated for each beam quality from the dose per mAs from the calibration data for each beam quality. The MOSFET response for doses from 0.8 to 4 cGy for 80 kV, 1.5 cGy to 6.4 cGy for 100 kV, and up to 9.5 cGy for 125 kV are shown in [Figure 7]. The linear regression values (R2) of the measured data show that the MOSFET response is linear for these kV X-ray beams for the low doses delivered during image guidance procedures. The dosimetric characteristics for commercially available high sensitive MOSFET dosimeters were studied with respect to energy response, angular response, and linearity of dose response. The variation in response of the MOSFET dosimeter with varying energy of kV X-ray beams (80–125 kV) was found to be within ±1% and hence it can be stated that the response of the MOSFET dosimeters is energy independent for the commonly used kV X-ray beam qualities in image guided radiotherapy. For regular in vivo dose measurements MOSFET dosimeters are placed on the surface of the patient to analyze the entrance or exit dose. In this study, we have investigated the variation in the response of MOSFET due to the change in angle of incidence of the beam. 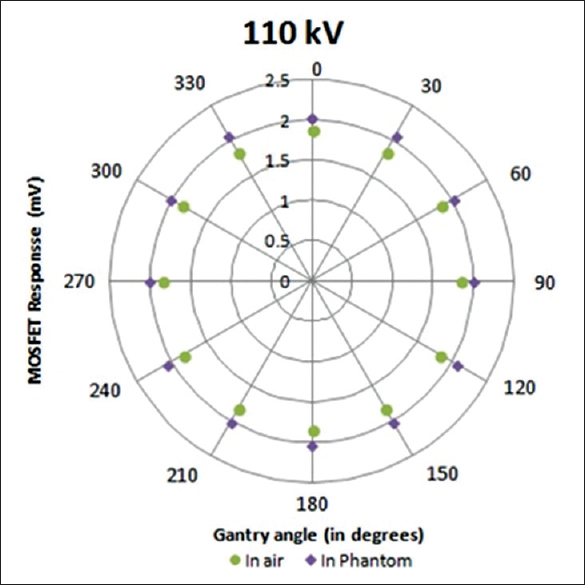 The maximum variation in response of the MOSFET for the gantry angles from 0° to 360° was found to be within ±2%. This study closely agrees with the study carried out by Ramaseshan et al. using micro MOSFET where the angular dependence was found to be within ±2% in a cylindrical phantom. The response of the MOSFET dosimeters was also found to be linear for kV X-ray energies available in the on-board imaging system of our medical electron linear accelerator. The high sensitivity MOSFET dosimeters were calibrated to measure absorbed dose during image guidance in radiotherapy, mainly with kV CBCT. The performance characteristics of these MOSFET dosimeters were analyzed for kV X-rays. It was observed that the MOSFETs are energy independent for certain energy range and showed a variation in linearity for all the energies. In this study, we observed that the response of the MOSFET is nearly independent of the angle of incidence of the beam. The dosimetric characteristics of MOSFETs were found to be suitable for in vivo dose measurements during image guidance with kV X-ray beams which is now a standard of care in the practice of high precision radiotherapy. This work was funded by Board of Research in Nuclear Sciences, Department of Atomic Energy, Government of India, Mumbai. Ma CM, Coffey CW, DeWerd LA, Liu C, Nath R, Seltzer SM, et al. AAPM protocol for 40-300 kV x-ray beam dosimetry in radiotherapy and radiobiology. Med Phys 2001;28:868-93. Yoo S, Grimm D, Zhu R, Jursinic P, Lopez F, Rownd J, et al. Clinical implementation of AAPM TG61 protocol for kilovoltage x-ray beam dosimetry. Med Phys 2002;29:2269-73. Ramani R, Russell S, O'Brien P. Clinical dosimetry using MOSFETs. Int J Radiat Oncol Biol Phys 1997;37:959-64. Ramaseshan R, Kohli KS, Zhang TJ, Lam T, Norlinger B, Hallil A, et al. Performance characteristics of a microMOSFET as an in vivo dosimeter in radiation therapy. Phys Med Biol 2004;49:4031-48. Halvorsen PH. Dosimetric evaluation of a new design MOSFET in vivo dosimeter. Med Phys 2005;32:110-7. Ding GX, Duggan DM, Coffey CW. Characteristics of kilovoltage x-ray beams used for cone-beam computed tomography in radiation therapy. Phys Med Biol 2007;52:1595-615. Ma CM, Li XA, Seuntjens JP. Study of dosimetry consistency for kilovoltage x-ray beams. Med Phys 1998;25:2376-84. Mail N, Moseley DJ, Siewerdsen JH, Jaffray DA. The influence of bowtie filtration on cone-beam CT image quality. Med Phys 2009;36:22-32. Ding GX, Coffey CW. Radiation dose from kilovoltage cone beam computed tomography in an image-guided radiotherapy procedure. Int J Radiat Oncol Biol Phys 2009;73:610-7. Ding GX, Coffey CW. Beam characteristics and radiation output of a kilovoltage cone-beam CT. Phys Med Biol 2010;55:5231-48. Ding GX, Coffey CW. Dosimetric evaluation of the OneDoseTM MOSFET for measuring kilovoltage imaging dose from image-guided radiotherapy procedures. Med Phys 2010;37:4880-5. Goharian M, Nygren I, Tambasco M, Villarreal Barajas JE. Angular dependence of the output of a kilovoltage X-ray therapy unit. J Appl Clin Med Phys 2010;11:3216.